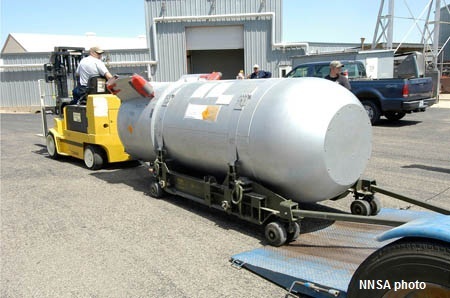 Last B-53 Nuclear Bomb Dismantlement: National Nuclear Security Administration officials on Tuesday will gather at the Pantex plant in Amarillo, Tex., to celebrate the dismantlement of the final B53 nuclear bomb in the US inventory. NNSA officials said the elimination of the B53 is a significant step in President Obama's nuclear security agenda that aims to reduce the size of the US stockpile. NNSA last October announced plans to dismantle the B53s, the last of which were retired in 1997. The B53, about the size of a mini-van and weighing approximately 10,000 pounds, entered the stockpile in 1962. B-47, B-52, and B-58 bombers were able to carry it. Each B53 had a reported nine-megaton yield. Last week, NNSA announced that it completed dismantlement of all W70 tactical nuclear weapons. Army Lance missiles carried the W70 during the Cold War.